Sometimes being an artist, any type of artist, is bewildering. Is what I'm doing good, interesting, needed? Will I ever make any money from it? Will anyone ever see these things that I create? Does anyone WANT to see these things I create? Should I give up this artistic pursuit and focus on a more practical existence? Whenever you think these thoughts, and if you are an artist or even attempt anything artistic you will think them at one stage or another, please read the below quote. It is true beyond belief and a much needed reminder of why we do the crazy things we do. 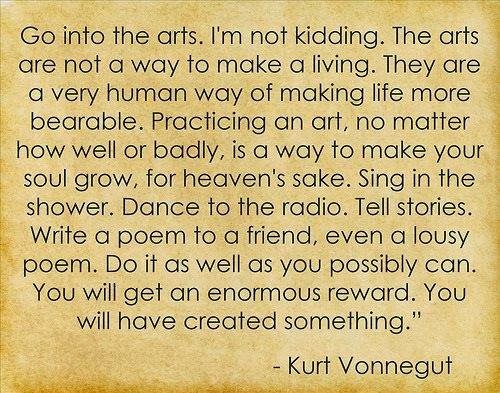 Go forth and create people!